TORONTO – February 20, 2019 – Silicon Valley Bank (SVB), the bank of the world’s most innovative companies and their investors, released its inaugural Canada Startup Outlook report today. 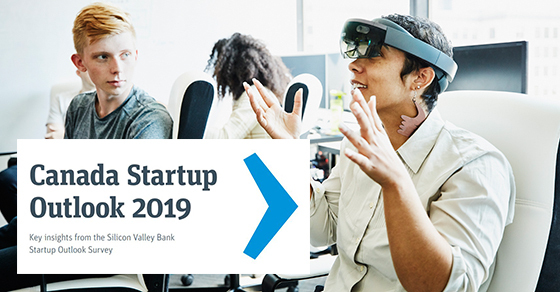 It is part of the 10th anniversary edition of SVB’s Startup Outlook Report, which is based on a survey of 1,400 startup founders and executives primarily in the US, the UK, China and Canada. Startup Outlook reveals respondents’ thoughts on business conditions, funding, exits, hiring, workforce diversity and public policy issues. More than half of Canadian startup leaders expect business conditions to improve in 2019 over 2018, but like their counterparts elsewhere, they note challenges in raising capital and hiring talent with the skills needed to grow their businesses. Following are the key findings from the 2019 Canada Startup Outlook Report. Most Startup Outlook 2019 respondents are founders or executives of companies with fewer than 25 employees and less than $25 million in annual revenue. Reports specific to the US, the UK and China are available here. More than half (56 percent) of respondents say they expect business conditions in 2019 to be better than 2018, and 31 percent expect conditions to stay the same. Thirteen percent of respondents expect business conditions to be worse in 2019, in line with the responses from US startup leaders. Nearly a quarter (24 percent) of startups surveyed say the current fundraising environment is extremely challenging. Nearly half (48 percent) of Canadian startups say they expect to raise their next source of funding from venture capitalists, while 28 percent expect angels, micro VCs or individual investors will supply their next round of funds. Despite the attention paid toward IPOs, most Canadian startups (56 percent) expect to be acquired. Forty-six percent of Canadian startups expect M&A activity to increase in 2019 and 40 percent expect activity to maintain 2018 levels. Canadian entrepreneurs say AI and big data are the technologies with the most promise today. Looking ahead a decade, they anticipate life science, autonomous transportation and cleantech/energy innovation will be the most promising. Eight in 10 Canadian startups say they plan to increase their workforce in 2019. While most startups plan to hire, 89 percent say that finding workers with the skills necessary to grow their business is somewhat or extremely challenging. Forty percent of Canadian startups have at least one woman on the board of directors and 60 percent have at least one woman in an executive position. Six in 10 Canadian startups say government benefits have a positive impact on the innovation economy. The three most important public policy issues affecting Canadian startups are access to talent, consumer privacy and cybersecurity. The most common government-sponsored programs startups have benefited from include the Scientific Research and Experimental Development tax incentive, Global Skills Strategy/Global Talent Stream and the Start-up Visa Program. For additional survey data, including a closer look at hiring, fundraising and respondents’ views on public policy issues, please visit: https://www.svb.com/startup-outlook-report-2019/. SVB will publish an in-depth report on Women in Technology Leadership in H1 2019. In March 2018 Canada’s Minister of Finance issued an order authorizing Silicon Valley Bank to establish a branch in Canada, which will commence operations after it receives the approval of the Superintendent of Financial Institutions. Once granted, Silicon Valley Bank will be able to provide in-market commercial banking solutions to private and public technology and life science companies and their investors across Canada. For more than 35 years, Silicon Valley Bank (SVB) has helped innovative companies and their investors move bold ideas forward, fast. SVB provides targeted financial services and expertise through its offices in innovation centres around the world. With commercial, international and private banking services, SVB helps address the unique needs of innovators. Learn more at svb.com/canada. Silicon Valley Bank is not authorized to undertake regulated activity in Canada and provides banking services from its regulated entities in the United States and the United Kingdom. Silicon Valley Bank received authorization to establish a lending branch in Canada in March 2018 and is awaiting the approval of the Superintendent of Financial Institutions to begin offering products and services from that branch. Silicon Valley Bank will not be accepting deposits from the public in Canada and will not be a member of the Canada Deposit Insurance Corporation.